Mladá Boleslav / Frankfurt, 11 September 2017 – As a true ŠKODA, the completely new ŠKODA KAROQ offers exceptional space, newest driver assistance systems, full LED headlights and a freely programmable digital instrument panel. The emotive and dynamic design with numerous crystalline elements characterises ŠKODA’s new SUV design language. Five engine variants are available with power outputs ranging from 85 kW (115 PS) to 140 kW (190 PS), four of them being new. Numerous smart ideas are on board such as the rear-seat VarioFlex system. Particularly long items can be comfortably transported in the interior of the compact SUV – this is made possible by the folding front passenger seat. It is clear from the exterior shape, modified lines and in comparision with the ŠKODA YETI larger dimensions that this is a completely new vehicle. The ŠKODA KAROQ is a sports utility vehicle with character: The emotive and dynamic design with numerous crystalline elements characterises ŠKODA’s new SUV design language. The compact SUV measures 4,382 mm in length, is 1,841 mm wide, and 1,603 mm high. The increase in size benefits the passengers. The kneeroom is 69 mm. The long wheelbase of 2,638 mm provides an indication of the generously proportioned interior. The ŠKODA brand stands for an exceptional package. This also applies to the new ŠKODA KAROQ. The luggage compartment has a capacity of 521 l with the rear seats in place. With the rear seats folded down, the volume increases to 1,630 l. In combination with the optional VarioFlex rear seats, the capacity is variable and can accommodate between 479 and 588 liters. The intelligent capability of pairing a car with a smartphone has reached a new level in the ŠKODA KAROQ. The SmartLink+ platform, compatible with Apple CarPlay, Android Auto, MirrorLink™ and SmartGate is available as an option for the basic infotainment system Swing. SmartLink+ comes as standard with higher infotainment systems. The Phonebox with inductive charging couples the smartphone to the roof antenna and simultaneously charges it wirelessly. The ŠKODA KAROQ offers state-of-the-art technologies for engines. Five engine variants – two petrol and three diesel engines – are on offer. The two petrol engines and two diesels are new in the line-up. The displacement ranges are 1.0, 1.5, 1.6 and 2.0 l; the power range is from 85 kW (115 PS) to 140 kW (190 PS). All powertrains feature turbo-charged direct injection units as well as start-stop-technology and brake energy recovery. From the very first glance, it is evident that the ŠKODA KAROQ is a completely new car. With its emotive and dynamic design as well as its numerous crystalline elements, it is the latest representative of the new ŠKODA design language. At the same time, the expressive and powerfully robust exterior clearly indicates its use as a compact SUV. The strikingly three-dimensional front section symbolises protection and strength with its outline. The front is characterised in particular by the geometrically shaped headlights with precise contours. As an option, the car can be equipped with full-LED headlights in a clear glass design from the Ambition trim level upwards. A narrow strip of lights running along the bottom edge of the main headlights provides homogeneous indicator and daytime running lights. The fog lights, which come with full-LED technology and a cornering function, are positioned below the main headlights. The radiator grille, which is framed by a chrome trim, features the trapezoid shape that is typical of ŠKODA. The large ŠKODA brand logo sits proudly at the end of the distinctive bonnet. The long wheelbase is easily visible from the side view and points to the generous interior. This view is characterised by short overhangs at the front and rear, the sloping roofline that is visually extended by a contour in the D-pillar, and the tapered rear. A line runs from the headlights to the rear with the high degree of precision; it streamlines the body and gives it structure. The angular wheel arches are framed by wide angular trims – a typical design feature for the ŠKODA SUV – and make the ŠKODA KAROQ appear even more powerful. The width of the body is emphasised at the rear by the horizontal lines. The flat, raked rear lights are divided into two: their outer section is embedded in the sidewall frames, whilst the inner section is in the tailgate. The reflectors sit below the rear sensors on the outer edges of the rear bumper. The lights at the rear include tail lights, brake lights and number plate illumination with LED technology. The tail lights form the ŠKODA-typical ‘C’ shape. The compact SUV is fitted with 16- or 17-inch wheels as standard, which are available with three different designs. 17-, 18- and 19-inch alloy wheels are optional extras. 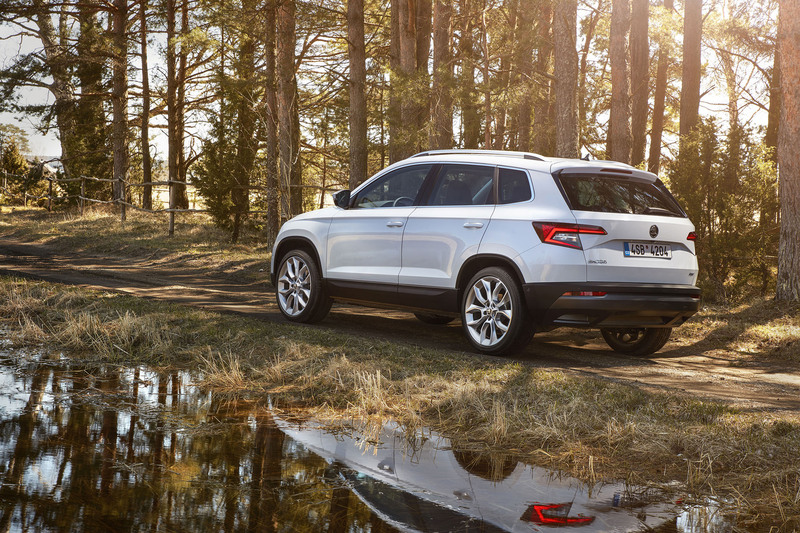 The compact ŠKODA KAROQ SUV is an all-rounder for the family, business, everyday life and leisure time. Besides the generous amount of interior space, state-of-the-art technology and well-thought-out equipment emphasise the car’s practicality and functionality. Headlights and tail lights feature LED technology; LED ambient lighting in the interior creates a relaxing atmosphere. 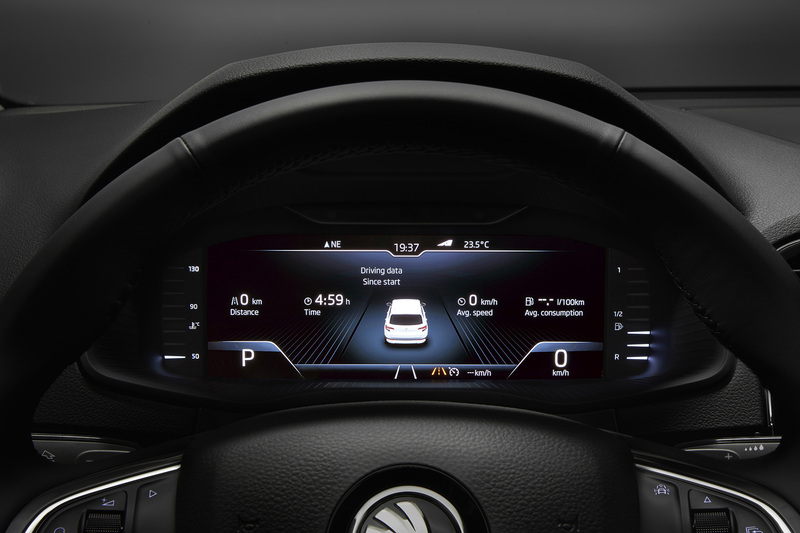 The digital instrument panel makes its debut in a ŠKODA. The driver can program the digital display to suit their preferences. The heated front and rear seats and the Phonebox in the centre console for the wireless charging of smartphones are further technological highlights. As an option, ŠKODA offers a heated steering wheel. In addition, some 20 ‘Simply Clever’ features are optionally available on board. The digital instrument panel is available for the first time in a ŠKODA. Four display layouts can be programmed. › The Classic layout presents both the rev counter and speedometer as round instruments on the right and left of the display. The area between them can be individually configured – for example, with a display of the entertainment program currently running or the map, which can also be zoomed in. › The Extended layout provides a main display covering the entire width of the panel – for example, the entertainment program currently running or the map. Above and below this, there is still space for small digital displays. For example, the current speed, the recommended gear, Traffic Sign Recognition, the remaining distance to be covered, the distance to the next junction on the programmed route or the distance already covered. › The Modern layout features a large display in the middle that can show the map, for example. To the left, right and above the map there is space for additional customised information. This could be the current speed, a navigational display with pictograms, a gear indicator, Traffic Sign Recognition (e.g. speed limit, restrictions on overtaking) or the journey time – to name just a few options. › The Basic layout provides two large displays showing the selected information. For example, these could be the current speed and the vehicle’s remaining range. Additionally, selected basic information (time etc.) is presented at the top and the bottom of the display. When route guidance is on, the navigation arrow is displayed in the centre. These four layouts only provide the structure of the panel. The driver can use a scroll button in the interactive display of the Modular Infotainment Matrix (MIB) to set which displays appear in which area of the panel and to set their sizes. Information about the audio system, the phone, the assistance systems (Lane Assist, Front Assist etc.) or the status of the vehicle can also be set to appear to the right, to the left, or centrally. The car comes with another two innovative features: the heated steering wheel and three personalisable keys. As soon as a certain driver unlocks the car, their individual settings are selected. These cover a wide range of operating areas, including driving profile selection, assistance systems, indoor and outdoor lighting, Climatronic, infotainment systems and electrically adjustable seats. In addition, the front and rear seats are heated. As an option, the ŠKODA KAROQ can be also fitted with an auxiliary heating. The ŠKODA engineers dedicated meticulous attention to detail when it came to the lights. As an option from the Ambition trim level upwards, the ŠKODA KAROQ can be fitted with full-LED headlights in a clear glass design. Standard equipment includes LED tail and brake lights, indicators (bulb) and reversing lights (bulb), rear fog lights (integrated into the bumper’s lower reflector) and a number plate light. Full-LED fog lights with cornering function are available as an option, either as part of a package or as an individual option. With Light Assist, a sensor continuously assesses the light conditions and automatically switches the headlights between daytime running light and dipped beam as required. This works in twilight as well as when driving through forests or tunnels. The lights are also turned on automatically as soon as the windscreen wipers are operated. The multifunctional camera used by the dynamic Light Assist feature detects oncoming traffic and vehicles ahead and ensures that in these situations the high beam is automatically turned off and on. The Coming Home and Leaving Home functions provide lighting for a defined period of time, and the car’s immediate surroundings are lit so occupants can safely get in and out of the car. In addition, when opening a door the ŠKODA logo is projected onto the floor (a part of the LED package as an option for Ambition and Style trim levels). In the interior, the new LED ambient lighting in the decorative strips incorporated into the doors and instrument panel, which can be set to one of ten colours, provides an impressive atmosphere (a part of the LED package as an option for Ambition and Style trim levels). ‘Simply Clever‘ has become synonymous with the ŠKODA brand. There are many practical features which increase comfort for the passengers on board. The numerous features contribute to the versatility of this compact SUV. Some 20 ‘Simply Clever‘ features are optionally available on board. The ŠKODA KAROQ has state-of-the-art technology under its bonnet. Five engines – two petrol and three diesel – are on offer. Their capacities are 1.0, 1.5, 1.6 and 2.0 l, while their power output ranges from 85 kW (115 PS) to 140 kW (190 PS). All powertrains use turbocharged, direct injection engines and offer Stop-Start technology as well as brake energy recovery. They are extremely efficient and fulfil Euro 6 emission standards. 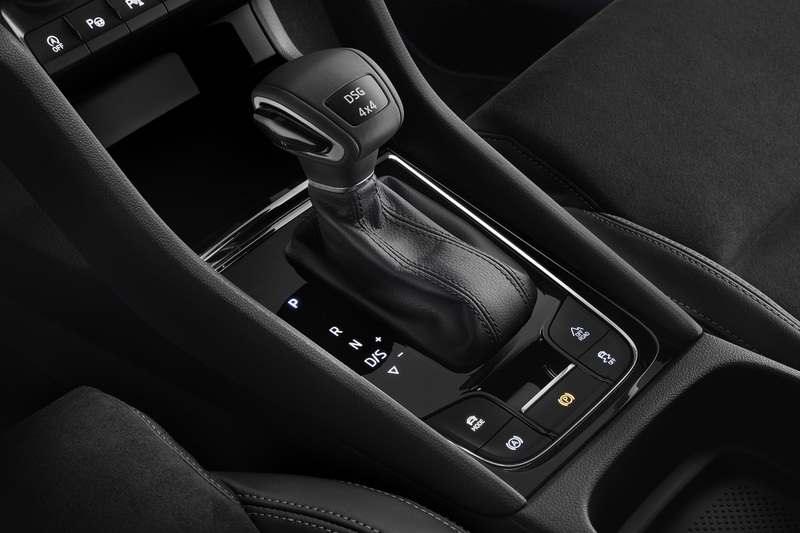 With the exception of the most powerful diesel, all powertrains are available with a choice of a 6 speed manual transmission or a 7-speed DSG transmission. The 2.0 TDI with 140 kW (190 PS) comes with all-wheel drive and a 7-speed DSG transmission as standard. The 1.5 TSI offers cylinder shutdown as a special feature. The official urban and extra-urban fuel consumption data for engines 2.0 TDI with 110 kW and 2.0 TDI with 140 kW are currently not available as the vehicle has not yet gone on sale and therefore Directive 1999/94 EC does not apply. There are five engines in the compact SUV’s range. The smallest petrol unit offers less cylinder capacity but more power. The 1.0 TSI has three cylinders, produces 85 kW (115 PS) and generates a maximum torque of 200 Nm. The engine impresses with its dynamic power development and a powerful sound. The downsizing increases the efficiency of the engine. This version of the ŠKODA KAROQ accelerates from 0 to 100 km/h in 10.6 seconds, attains a top speed of 187 km/h and consumes an average of 5.2 l per 100 km. For power transmission, it uses either a 6-speed manual gearbox or a 7-speed DSG. The distinctive feature of the 1.5 TSI engine with 110 kW (150 PS) is its Active Cylinder Technology (ACT). This works by switching off the second and third cylinders for a short time when their power output is not needed. The engine therefore runs more efficiently and, depending on the driving style, saves up to 0.5 l per 100 km. ACT is used between 1,400 and 4,000 rpm and up to a speed of 130 km/h. With the 1.5 TSI, the ŠKODA KAROQ sprints to 100 km/h in 8.4 seconds from a standing start, reaches a top speed of 204 km/h and consumes an average of 5.4 l per 100 km. Here, too, there is a choice of a manual 6-speed gearbox or a 7-speed DSG transmission. All of the diesel engines are turbocharged, direct injection TDIs with four cylinders and four-valve technology. The entry-level variant is the 1.6 TDI with a power output of 85 kW (115 PS) and a maximum torque of 250 Nm. This version of the compact SUV accelerates from 0 to 100 km/h in 10.7 seconds, attains a top speed of 188 km/h and consumes an average of 4.5 l per 100 km. The power is transmitted by either a 6-speed manual transmission or a 7-speed DSG transmission. The diesel engine with a cylinder capacity of 2.0 l is available in two power variants. Both versions impress with distinctive smooth running and superior torque. The 2.0 TDI with 110 kW (150 PS) comes with either a 6-speed manual transmission or a 7-speed DSG transmission. Maximum torque of 340 Nm is achieved between 1,750 and 3,000 rpm. 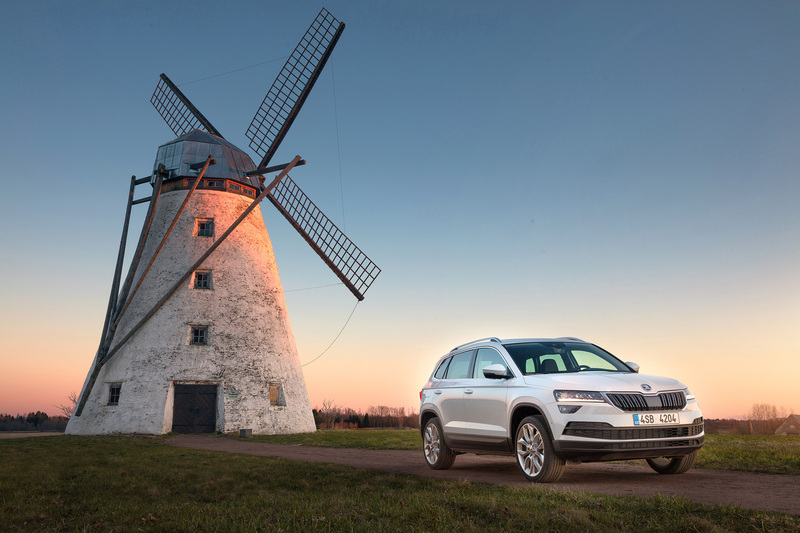 The ŠKODA KAROQ with a 2.0 TDI engine and 110 kW (150 PS) with all-wheel drive and manual transmission accelerates from 0 to 100 km/h in 8.7 seconds, achieves a top speed of 196 km/h and consumes 5.0 l per 100 km on average. The second 2.0 TDI offers a power output of 140 kW (190 PS). The top engine variant is combined with all-wheel drive and a 7-speed DSG transmission as standard. Maximum torque of 400 Nm is available between 1,750 and 3,250 rpm and offers impressive tractability and sporty acceleration. With a 2.0 TDI engine and 140 kW (190 PS) of power, the compact SUV sprints to 100 km/h from a standing start in 7.8 seconds, reaches a top speed of 211 km/h and consumes an average of 5.3 l per 100 km. The chassis sets new benchmarks in the segment and also shows its quality when venturing off surfaced roads. Driving Mode Select with the Normal, Sport, Eco, Individual and Snow (4×4) modes is available as an optional extra from the Ambition trim level upwards. The Off-Road mode for all-wheel-drive vehicles further improves the driving characteristics when travelling off road. 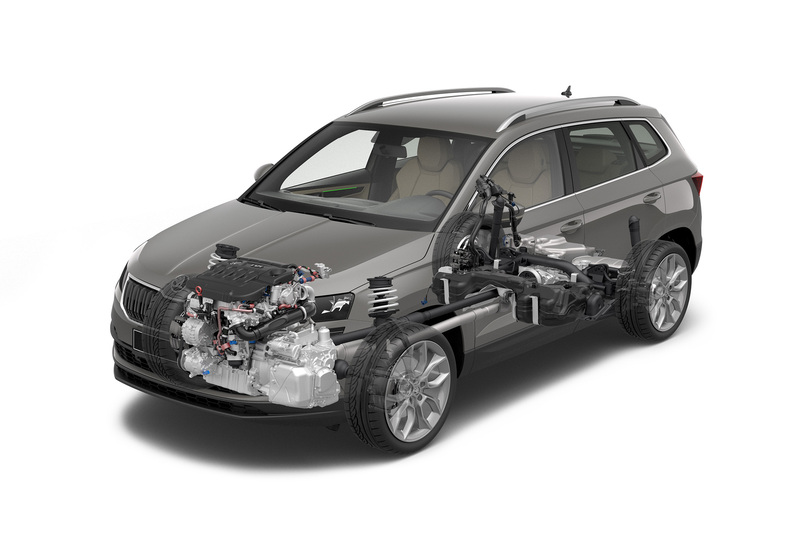 The chassis of the ŠKODA KAROQ has a sophisticated and harmonious design. It gives the compact SUV distinct all-round characteristics including genuine off-road capabilities. One important factor for the well-balanced distribution of the load on the axles is the front axle, a MacPherson design with lower triangular wishbones and a subframe made from steel, which has been placed far forward. The front track measures 1,576 mm. The four-link rear axle (in the all-wheel-drive variant) is largely made from high-strength steel; its track width is 1,541 mm. The sword-shaped trailing arms absorb the driving and braking forces. Three wishbones per wheel keep the wheels in the optimum position in relation to the road at all times and guarantee precise track guidance. 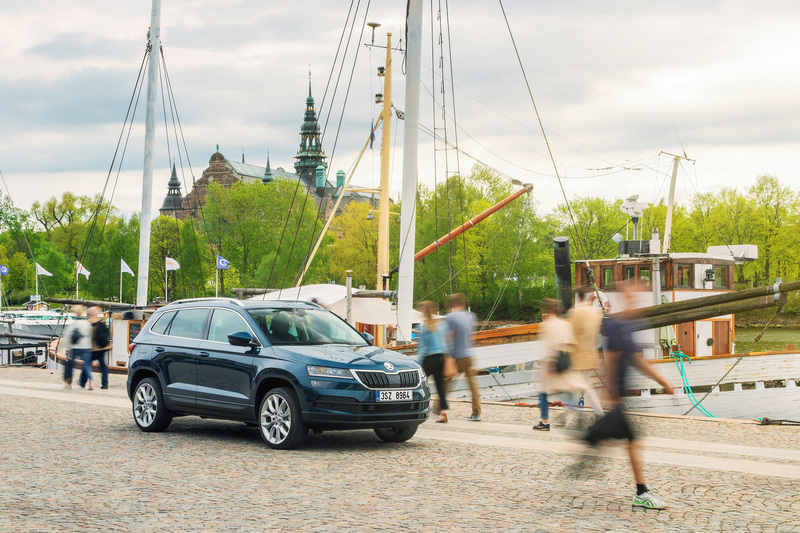 Thanks to Dynamic Chassis Control (DCC), the driver will have three chassis modes available in the compact ŠKODA KAROQ: Comfort, Standard and Sport. Electrically operated valves adjust the dampers’ settings. A control unit operates the valves depending on the road conditions, preferred driving style and the chosen mode. DCC contributes to active safety by automatically stiffening the shock absorbers in corners which are navigated particularly dynamically. This provides greater stability, better traction and shorter braking distances. DCC chassis control, including Driving Mode Select, will be available for the 1.5 TSI and the two 2.0 TDI versions from the Ambition trim level upwards. With Driving Mode Select, the driver can change steering characteristics, operation of the DSG transmission, and the settings of other systems in the Normal, Eco, Sport, Individual and Snow modes. The individual settings are saved on the optional, personalisable key for up to three vehicle users. The compact SUV’s all-wheel drive also ensures optimum handling on slippery terrain or when towing a particularly heavy trailer. It uses an electronically controlled multi-plate clutch. Various sensors (such as those for rpm at the wheels, steering angle, longitudinal and lateral acceleration, throttle position, rpm, torque etc.) continuously assess the driving situation and relay the measurements to the all-wheel-drive electronics, which then calculate and distribute the optimum amount of power. Off-Road mode, which provides even better driving characteristics on rougher terrain, is an optional extra for the all-wheel-drive variants. To improve traction in Off-Road mode, the Traction Control System (TCS) permits a greater slip and the Electronic Differential Lock (EDL) reacts sharper and faster. Where necessary, Hill-Hold Control and Hill-Descent Control are also activated – the latter keeps the speed constant during the descent. The optional DCC shock absorbers change their characteristics, and the accelerator responds more gradually. The Anti-lock Braking System (ABS) varies its intensity, so that a wedge of earth can be formed in front of the wheels, thereby producing a braking effect. In the Snow mode, the electronic assistance features are set to cope with low-grip surfaces. The operation of the ABS is similar to that in the Off-Road mode (making use of snow piled up in front of the slipping wheels). Those who intend to use the ŠKODA KAROQ on rougher terrain will benefit from the Rough-Road package, which protects against mechanical damage (e.g. when hitting bumps or on gravel) and prevents dirt (dust, sand, mud) from getting into the engine bay or cable harnesses. The Rough-Road package consists of: an engine skid plate, cable protection, brake line protection and additional protective plastic covers. The car comes with an electromechanical parking brake as standard. With its two electric motors, it is integrated into the braking system at the rear axle and can also be used as an emergency brake. In conjunction with the DSG transmission, it incorporates an Auto-Hold function. In traffic jams or stop-and-go situations, the Auto-Hold function keeps the vehicle stationary without the driver having to press the brake pedal. It is set or released using a button in the centre console. The Electronic Differential Lock (EDL) provides additional traction support. It allows the driver to pull away smoothly and comfortably on road surfaces with varying grip. If a wheel is spinning, EDL applies the brakes selectively and ensures that power is transmitted to the wheel with better traction. The compact SUV offers many driver assistance systems that are only seen in higher vehicle segments. For the ŠKODA KAROQ, a wealth of driver assistance systems is available. The safety systems provide pedestrian protection and keep the compact SUV at a safe distance from the car in front. They make it easier for the driver to change lanes and stay in lane, help them to park, and make them aware of important traffic signs. Radar-based Adaptive Cruise Control (ACC) maintains the desired gap from the car in front, meaning the system can reduce the speed of the car or discretely apply its brakes prior to a potential collision. Besides the speed, the driver can also progressively configure the distance and how dynamically ACC is to work. The optional Blind Spot Detect and Rear Traffic Alert features make driving safer and more relaxed. From a speed of 10 km/h, two radar sensors at the rear monitor traffic behind the compact SUV. If another vehicle moves in the blind spot or rapidly approaches from behind, an LED warning light illuminates in the visible area of the corresponding wing mirror. Should the driver use the indicator despite the warning, the LED flashes brightly at short intervals. When reversing out of parking spaces or driveways, a warning signal sounds if another car approaches from the side, complemented by a visual warning on the in-car monitor. If necessary, the ŠKODA KAROQ automatically applies the brakes. The standard Front Assist feature including City Emergency Brake with Predictive Pedestrian Protection uses a radar sensor. The radar captures a large area and also works reliably when visibility is poor. Should the system sense that a collision is imminent, it warns the driver in stages. If necessary, it can initiate automated braking up to an emergency stop. City Emergency Brake is active up to 34 km/h. The standard Predictive Pedestrian Protection feature complements Front Assist: it initiates an emergency stop at speeds between 10 and 60 km/h if a pedestrian dangerously attempts to cross the path of the car. At speeds exceeding 40 km/h, an additional collision warning is emitted. Hill-Hold Control allows the driver to pull away on a slope without the risk of rolling backwards. The handbrake does not need to be used. At speeds above 65 km/h, Lane Assist helps the driver by using a camera in the rear-view mirror mount. If the compact SUV approaches a road marking without using the indicators, then the system helps the driver to stay in lane by initiating a subtle corrective steering manoeuvre. Traffic Jam Assist makes it easier to drive the car in traffic. This system provides more safety and comfort in traffic jams and stop-and-go traffic. Traffic Jam Assist works in combination with the Adaptive Cruise Control and Lane Assist systems. ACC and Lane Assist ‘fuse’ into Traffic Jam Assist. In this case, Lane Assist comes with adaptive lane guidance which helps the vehicle to stay in the lane at speeds below 60 km/h. When ACC is active at the same time, steering, braking and acceleration are carried out automatically, even in traffic jams. The driver’s hands must be on the steering wheel for this to work. The camera-based Traffic Sign Recognition detects the most common traffic signs and displays them as a pictogram on the digital instrument panel and/or on the navigation system. The same applies for the current speed limit and restrictions on overtaking. Using the steering characteristics, Driver Alert detects deviations from the driver’s normal behaviour and thereby a reduction in their concentration. The system analyses the steering characteristics 15 minutes after the engine has been started and saves the information as the basis for a signal. During this analysis phase, a minimum speed of 65 km/h must be maintained. A significant deviation from the characteristic steering behaviour indicates driver fatigue. A visual warning on the instrument cluster prompts the driver to take a break. Thanks to ŠKODA Connect, occupants are ‘always online’ with the new mobile online services. The intuitive systems are divided into two categories: the Infotainment Online services providing entertainment and information, and the Care Connect services providing support and assistance. The offering includes real-time navigation with recommended diversions in the event of a traffic jam, an automatic Emergency Call and the Parking Location function, which guides the driver to the car. Journeys can be programmed at home and transferred to the vehicle online. Gesture control, which makes it easier to operate selected functions, is also new. Infotainment systems are broad and diverse, work quickly, offer numerous functions and interfaces, and with exception of the Infotainment system Swing are all equipped with capacitive touchscreens. Four hardware components are available: the Swing (standard) and Bolero infotainment systems as well as the Amundsen and Columbus navigation infotainment systems. The optional Bolero, Amundsen and Columbus infotainment systems’ screens in the new glass design enhance the high-quality instrument panel. In addition to the display and operating concept, the compact SUV has a gesture control feature for selected functions (available for the Columbus navigation infotainment system). A proximity sensor detects and identifies defined hand movements that the driver makes around the centre console. This allows the driver to scroll through the menu of the infotainment system using hand gestures, without having to take their eyes off the road. The Mobile Online Services from ŠKODA Connect provide extensive additions to the infotainment offering. Infotainment Online services provide information and entertainment, and the Care Connect services provide support in numerous situations as well as remote vehicle access. Online Traffic Information is an important part of the Mobile Online Services: it displays the current traffic flow on the selected journey and suggests alternative routes in the event of a traffic jam. Additionally, the services provide tailored information about nearby petrol stations (incl. current fuel prices along the chosen route), parking spaces, news and the weather. The Care Connect services support the driver in many situations and are available for all infotainment systems. The services include the automatic Emergency Call and Proactive Service (can be used to arrange and prepare for a vehicle service appointment) functions as well as remote vehicle access. The automatic Emergency Call function is particularly important. Emergency Call is automatically activated after a restraint system, such as an airbag, has been deployed. The car establishes a voice and data connection to an emergency call centre and transfers all of the necessary information. The driver or passengers can also trigger the Emergency Call manually via a button in the roof module. The driver can also make a Breakdown Call via a button in the roof module. The third button in this module, displaying an ‘i’, connects an Info Call – which, for example, can be used to ask experts in the customer call centre technical questions about the vehicle. The ŠKODA Care Connect services in the ŠKODA KAROQ also include the services for remote vehicle access, which are available via the ŠKODA Connect app, i.e. on the user’s smartphone. Here, the Vehicle Status service remotely provides information about the status of the lights and fuel level as well as whether the windows, doors or sunroof are open. The auxiliary heating can be controlled with the smartphone as well. The Parking Location function shows the location of the car, and the Honk & Flash function makes it even easier to find the car by activating its horn and hazard warning lights. Don’t want the car to leave a predefined area or be driven at a speed exceeding 130 km/h? The Area Notification and Speed Notification functions inform the owner if this occurs against their wishes. The Driving Data function rounds off the portfolio. The ŠKODA Connect app is complemented by the ŠKODA Connect portal, which brings the ŠKODA Connect services to the customer’s home computer. The portal can be used to configure services as well as transfer destinations and routes to the car.